Lovely tie. Bought this for my husband to wear with his blue suit for a wedding next week. Good price too. Great price and product, topped off with excellent service and speedy delivery. Couldn't be happier. 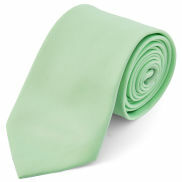 This category features solid colour ties. Use the menus to find the necktie you are looking for. All ties are in stock. 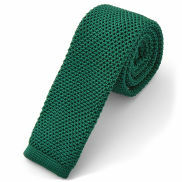 Classic solid colour ties have been around since neckties were invented. Originally made to go with business suits but, once sport jackets became fashionable, it is now wide open. The more staid solid colours are still de rigueur with generally more conservative business attire. The wilder neon colours fit well with sport jackets so they are perfect for parties and nights out on the town. Our Trendhim selection tries to cover that gamut. With such a wide range of materials and colours to choose from, an inventory of your suit and sport jackets is a must especially if you have not recently update your tie collection. Rest assured that we follow all of the latest fashion trends closely and that our tie inventory is up to date with the popular, latest widths. Please feel free to contact us, especially if you donât find a particular solid colour that you are interested in. And do not forget to sign up for our newsletter, it contains plenty of updates on latest trends and new arrivals.